1. How Does Acupuncture Work? In spite of a great deal of excellent research designed to answer this question, as yet there are no good, clear, simple answers available. There are, however, a variety of theories that attempt to explain the mechanism of acupuncture. Pain is the area in which most research has been completed, and therefore most of the theories about the mechanism of acupuncture are related to the use of acupuncture in diseases of pain. every time we touched something. 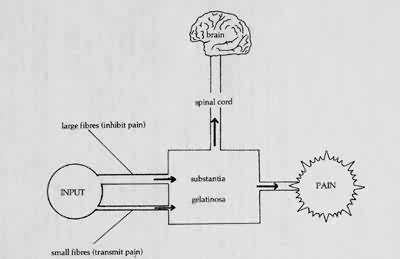 This theory proposes a balance between stimulation of the pain fibers and inhibition of that stimulus, so that pain is perceived only if the pain input overrides the inhibition of pain. The only problem with this theory is that it does not explain fully the available facts. Acupuncture excites the pain inhibitory nerve fibers for a short period of time, thereby blocking pain, but the effects of acupuncture can last for some months after the acupuncture needle has been removed, and nothing in the Gate Theory really explains this prolonged effect. Acupuncture is a valuable treatment in a variety of non-painful diseases and the Gate Theory makes no attempt to explain the mechanism of acupuncture in the treatment of these diseases. Another theory frequently proposed for acupuncture is that it represents a type of counter-pain. If pain is created in one part of the body then pain experienced in another part of the body is not noticed. This is a valid experimental model for short term relief of relatively mild pain, but again it does not explain the long-lasting effects of acupuncture in some types of severe pain. The growing level of drug addiction in the West has provided a great stimulus for research into the mechanism of morphine action and addiction. Morphine-like substances have recently been discovered in the central nervous system. These substances are called endorphins, or naturally-occurring morphines,1 and they have been found to be very effective in blocking pain. Endorphins are released into the nervous system by the action of acupuncture and the effects of acupuncture anaesthesia can be reversed by the use of anti-morphine drugs. From some recent research work it would seem that not all types of acupuncture are blocked by anti-morphines. If a patient has a painful arthritic knee, and acupuncture provides relief for the knee pain, then anti-morphines do not usually block the effects of this type of acupuncture therapy. The effects of acupuncture can be very swift (in terms of seconds) and it seems that the release of chemicals might possibly be too slow a process to have such a swift action. The endorphin theory again only deals with pain and makes little attempt to explain the use and effects of acupuncture in non-painful diseases. The fact of the matter is that acupuncture does work, and has been shown to do so, but the exact answer as to how it works is unclear. The current scientific explanations give a logical and supportable basis for stating that it does have an effect on the nervous system, but it is difficult to draw any more definite conclusions. The mechanism of pain perception and transmission has not been clearly and completely defined, and in the light of the current state of knowledge about the basic mechanism of pain it is a little unreasonable to expect an explanation of the effects of acupuncture on pain. It is fascinating to speculate about the mechanism of acupuncture in the non-painful diseases, such as asthma. The autonomic nervous system control's the body's breathing, heart beat and digestion. It continues to function without any conscious will, but it should not be confused with the unconscious mind, frequently alluded to in text-books on psychology. It is really better to think of the autonomic system as the automatic base or foundation on which the body is built. We understand very little about the way in which the autonomic system works, and even less about how acupuncture might affect this system. Asthma is due to a contraction of the small breathing tubes that allow air to enter the lungs. As these tubes contract, and become gummed up, the air flow in the tubes becomes turbulent, causing the whistle or wheeze that is heard in asthma. The small breathing tubes are lined with muscle, and this muscle is largely controlled by the autonomic system. When acupuncture is used to treat this type of disease it is logical to suppose that it works through the autonomic system, and it seems possible that many of the effects of acupuncture, on diseases like indigestion and diarrhoea, work through the same system, but as yet there are no unified theories that explain either the autonomic system or the effects of acupuncture on this system. It is quite likely that when we understand this system a little more fully we will be able to understand the mechanism of acupuncture a little better. It is also possible that the body is influenced far more by the autonomic system than we now believe. If the autonomic system is anaesthetized, then severe intractable pain can sometimes be alleviated; for instance, if severe arm pain is experienced then it may be possible to cure the arm pain by infiltrating local anesthetic into the autonomic nerves that supply the arm. As the local anaesthetic wears off so the arm pain returns. This observation has no real explanation at the moment, because the interplay between pain and the autonomic system is unexplained. Acupuncture has been criticized for being no more than a complex form of 'hypnotic suggestion'. Available research work shows that those gaining benefit from acupuncture treatment are no more or less suggestible than those for whom acupuncture does not work. It would therefore seem that acupuncture does not depend on suggestibility. At the same time, acupuncture does have a certain amount of 'magic and mystery' surrounding it. Almost certainly this creates a small amount of benefit although it does not fully explain the dramatic and significant therapeutic effects of acupuncture. Some research workers, particularly in Russia, have suggested that fields of biological activity exist around all living objects. The concept of 'biofields' has little hard scientific evidence to support it, but there are people in both Russia and America who are suggesting that acupuncture may work through these 'fields Dr. Nogier's pulse reflex may possibly be part of the effect of such 'biofields'. At present there are no good grounds for accepting or rejecting these theories. Whatever scientific theories are used to explain the mechanism of acupuncture, not one, at present, explains where to place an acupuncture needle when the acupuncturist is confronted by a patient. The choice of which acupuncture point to use is largely based on the information obtained from traditional Chinese acupuncture, and even those acupuncturists who know no traditional theories use recipes based on them2 We will remain dependent on the empirical experience and philosophical theories of the ancient Chinese until a method of point selection can be deduced from an understanding of the scientific mechanism of acupuncture. Science will, and should, provide an explanation for the observations of the ancient Chinese, but in the meantime we should not reject acupuncture just because we cannot explain it completely. 1 Morphine, heroin and opium are all related chemicals, collectively called opiates. 2 An acupuncture recipe is a selection of points used for a particular disease. No attempt is made to follow a traditional diagnosis, the points are just learnt ant used automatically.